Naples, Fla. (November 16, 2018) – Closed sales of homes in the Naples market grew 20 percent to 674 sales in October 2018 compared to 561 sales in October 2017. The last few months have seen not only a return to a steady housing market for Naples since Hurricane Irma, but also an increased buyer appetite for homes in Collier County. 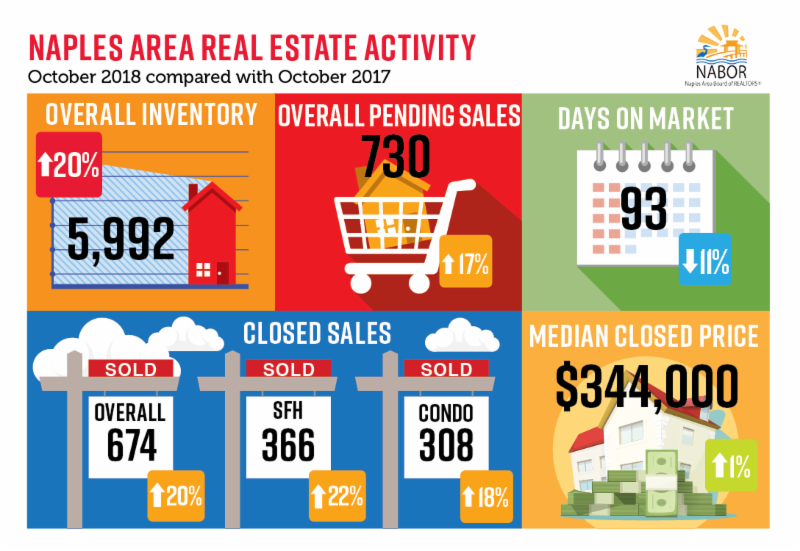 We are pleased to report that inventory during October jumped 20 percent to 5,992 homes – the highest October inventory level since 2012 – which is good news for buyers according to leading broker analysts who reviewed the October 2018 Market Report released by the Naples Area Board of REALTORS® (NABOR®), which tracks home listings and sales within Collier County (excluding Marco Island).